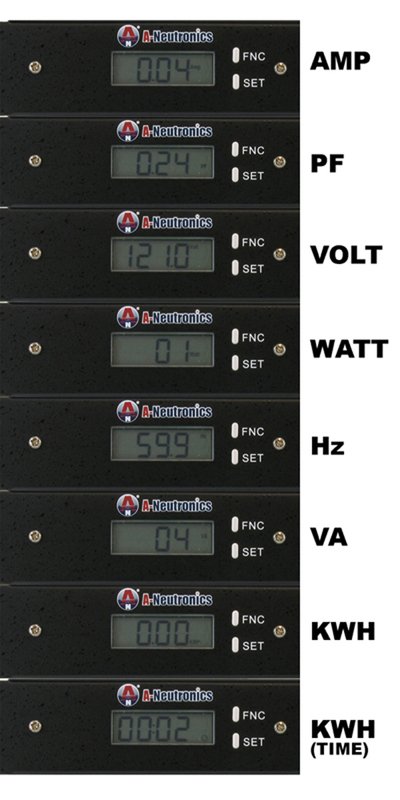 The MS-1917-LCD AC power distribution unit offers 15 amps, 120 volt capacity in a single rack mount cabinet.The built in power meter has (8) different displays showing Volt, Amps, Watt, VA, Frequency, Power Factor, Kilowatts, and KW per hour. Fixed mounting flanges offer a solid rack mount installation. Uses only (1) rack space (1U) when installed in any 19 inch rack. Attractive all-steel housing with (10) rear-facing outlets and (7) front-facing outlets measures only 4.5 inches in depth. Unfiltered electrical pass-through and lighted switch with a latching safety cover prevents risk of accidental turn-off. Ideal for distributing alternate waveform UPS or generator power in rack enclosures, network closets and more. Includes 15 foot AC power cord, 15 amp circuit breaker and a 3-year limited warranty. There is a lighted LCD Volt Meter to let technicians know exactly how much power is being drawn before they plug in additional equipment.